I just got back from my busiest conference of the year in San Diego. 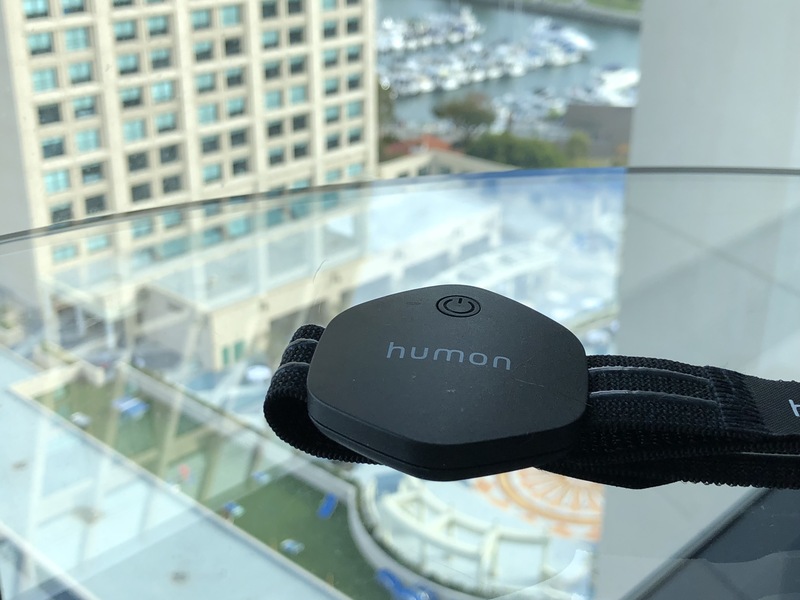 While I was there, I had a chance to put together some of my thoughts on the new Humon Muscle Oxygen Sensor and how it plays a valuable role in my training. The Humon Hex Muscle Oxygen Sensor is just that– a muscle oxygen sensor. As my readers know, I’ve been a big fan of the now-defunct BSX Insight. I’ve also previously written a highly popular snapshot summary of different ways that a muscle oxygen can be used in training. So you might think that another muscle oxygen sensor might not be the most thrilling news of your day, but I think this one is different– and that it may help play a key role in your training. Here’s why. The Humon is different from the other muscle oxygen sensors on the market for a number of reasons. Here’s a quick rundown. The Magic is in the Software. There’s a trend happening in the digital world as companies (and consumers) realize that, while lots of data is great, most of it isn’t useful for most consumers. The solution is to use software to reduce a bunch of fairly random data into something actionable and immediate. For instance, who cares what your heart rate variability is unless it can give you an immediate answer about your stress level? The Humon Hex also uses software to give you actionable answers in realtime. While it displays your muscle oxygen numerically, the real magic is that it displays your muscle oxygen “color.” If the number is green, you’re in “steady state,” which means you can keep going for quite a while as your oxygen needs are being met. If it’s blue, you’re in “recovery,” meaning that you’re taking in more oxygen than you’re using. You want to see blue numbers, for instance, after you have done a hard interval. If your number is orange, then you are “approaching (your) limit.” This means that your oxygen consumption is currently higher than your lungs and heart are able to provide it. You can’t stay in orange forever and generally you’ll either go to green (e.g. your body discovers a new way to get more oxygen, such as dilating your blood vessels), go to red (we’ll cover that next), or you’ll just need to stop and recover. Lastly, there’s red, which means that you’re at your limit. This doesn’t mean that you’ll stop immediately– it just means that your won’t last long because your oxygen levels are falling off a cliff. If you’re used to using a Moxy or BSX Insight, you’ll notice immediately how helpful some color coding like this can be. Measuring your bodily states that give rise to these easy-to-use colors is part of Humon’s secret sauce and where the real value lies. They combine data on muscle oxygen and total hemoglobin to determine whether you’re in a blue, green, orange, or red state. And it’s all done in realtime so you can make training decisions based on it. It’s More Versatile. All muscle oxygen sensors for everyday athletes use near infrared spectroscopy that shines a red light into your muscle and measures the light patterns that are reflected back. This makes them very sensitive to ambient light. Both BSX and Moxy use special light shields to ensure that outside light doesn’t interfere with the data. Interestingly, Humon doesn’t– you just strap it on your quadriceps and go. While I’ve had plenty of “dropouts” in my data on the Humon, I’ve had just as many on my BSX. I assume they’re able to get clean data without light shielding either with their fancy software or with witchcraft. They are based in Boston, after all. It’s Much Easier to Measure FTP/LT. Ask any serious cyclist what their FTP is and they can tell you exactly how many watts they measured in their last test. FTP (which is roughly lactate threshold or “LT”) is a critical measure of fitness. But to get that number, you have to endure a grueling test– and, for most athletes, that number is several months old and rarely reflects their current fitness. Now, imagine being able to just “warm up” on a trainer and, by the time you’re done and ready for your workout, you know exactly what your FTP/LT is for today. That’s the potential promise of using a Humon, as I’ll explain later. Humon has plenty of information on the Humon website about how to install it and use it. In a nutshell, you can use the Humon app either on an iPhone or Android device and get all the data you need, including the fancy color coding. In fact, this is exactly how I use it most of the time because I’m never without my phone. But you may want to be a bit more nimble and use it on your sports watch. Here is where things get a touch more complicated as, while Humon does have great support for Garmin devices, you can’t have everything at once. Humon originally gave you two choices. You could download the Humon app for your Garmin sports watch and get all the data and color coding you need. The problem was that Garmin apps can’t record data for later uploading to Garmin Connect. This meant that you couldn’t get your workout data uploaded to TrainingPeaks and off to your coach. That wasn’t terribly useful and Humon has since remove the app from the Garmin Connect site. The second option is to download the Humon data field for your Garmin sports watch. Then you can display your current muscle oxygen value and your data (including muscle oxygen) gets loaded to Garmin Connect– but you lose the color coding (which is at least 90% of the value). I’ve talked to the folks at Humon and they said that they’re working hard on getting the color coding on the Garmin data field. In the meantime, I just pull out my phone if I need to see what “state” I’m in. While this sounds like a massive pain in the neck, it’s not that terrible. Nevertheless, I’m waiting with bated breath for the data field update because color coding really is essential (as will become evident after reading below). Okay, so now you’ve got the Humon Hex hooked up and ready to go. You also have your Garmin watch displaying and recording your muscle oxygen and your iPhone displaying the color of your workout. Now we can dive into actually using the Humon Hex in our workouts, right? Hold on for a minute, Speedy, there are a few things that you need to know about using one of these things before you start basing all of your workouts on muscle oxygen data. Data is Useless Without a Great Warmup. If you’ve ever used a muscle oxygen sensor, you’ll know this already. It takes a good long time before your muscles are fully oxygenated and warmed up. Seriously, a 10 or 15-minute warmup won’t do it. Instead, warming up really takes at least 25-30 minutes to complete. Warming up involves two processes– increasing blood flow (and muscle oxygen) and fully dilating blood vessels. The same workout can look entirely differently to a muscle oxygen sensor with or without a good warmup– and, yes, you’ll feel that difference too (i.e. the workout with the proper warmup will go much better). Fortunately, a Humon Hex can help guide your warmup (see below). Don’t Expect Perfection– Biological Systems are Not Mechanical Systems. While I was tending to my ill kitty last year, I was reminded of this painful lesson. Unlike physical systems that behave in perfectly predictable ways, living organisms are not entirely predictable. There are simply too many factors to make your body so predictable. While you may respond that your FTP test values are fairly predictable, I’d respond that’s because you go into your FTP tests with a good expectation about what your goals are going to be and so you make it predictable. If you did all your FTP tests “blind” to your current performance, I suspect your test values will be quite a bit more varied. By contrast, with muscle oxygen readings, you can’t skew the results– they are simply what they are. There is No Such Thing as Zones. If you’re used to used “heart rate zones” or “power zones” to guide your training– and hope to determine your “oxygen zones” with a muscle oxygen sensor, I’m sad to report that you should abandon those hopes. It simply doesn’t work that way. Some days, you may be recovering to 75% SmO2 and other days, you may be at 82% even though you’re working out just as effectively. You can’t just say, “well, I raced really hard and held my SmO2 at 63%.” The closest that you can come to zones is the blue, green, orange, red color coding provided by the Hex– but even this is entirely determinative. The reason why it works out this way is that, with muscle oxygen, it’s all about looking at trends in muscle oxygen values and not the static values themselves. This makes it entirely different from other metrics, like heart rate or blood lactate where that static value can tell you a lot. With that said, there are a few limited instances where the muscle oxygen values themselves matter (notably in warmups and recoveries), but generally the trends (as evidenced by the Humon colors) is a lot more important. We’re Still Learning. Just about everything I’m about to say below is based on what I’ve read, what I’ve noticed, or what I suspect is going on. It shouldn’t be treated as gospel when it comes to training. Instead, it’s really just ideas that you can test for yourself with a Humon Hex. Some of these ideas may work great and some may be utter garbage. That’s really no one’s fault– training with muscle oxygenation data is a very new concept. I personally think warmups should start really slow– either with a walk or “soft pedaling” below 50 watts– and gradually build from there. By the end of the warmup, which should take at least 20-25 minutes, you should be going at a pretty good clip and at least at sweet spot or half-marathon pace. The Humon “incremental” test (see below) does a really good job at gradually increasing your pace. Of course, your muscles should also be quite warm by the end of your warmup, no matter what your muscle oxygen and other data sensors say. A Humon Hex is useful for validating the “quality” of your warmup. While muscle oxygen varies day-to-day for unknown reasons, you nevertheless can develop an understanding of the basic ranges for your maximum SmO2. For me, my muscle oxygen pretty much tops out around 75-78%. And this is the number that I want to be shooting for if I pause my workout at the end of my warmup. If I’m not close to that range (e.g. below 70%), I know that I may need to toss in a few strides or easy sprints to help “open up” my muscles and really get them warm. This is the primary use case for the Humon Hex. I think the real value of the Humon Hex is when you’re working out harder than your threshold pace– basically your one-hour pace (running) or your FTP (cycling). As I’ve described in countless posts earlier, this is the point where the wheels start falling off the truck. At this point, a ton of changes happen in your body. While we call it “lactate threshold,” there are hormonal, neurological, respiratory, and cardiovascular changes that all happen roughly simultaneously. And one of those changes is also a sharp decline in muscle oxygen. But race performance and fitness will both improve greatly if we can raise this set point as much as possible. But doing that requires sometimes doing interval training above this point. A Humon Hex is great for interval training but could stand some improvement. On the left is a screenshot of a workout I did with my Humon (the “Downward Spiral” video workout from Sufferfest). Apologies for the hard-to-discern screenshot– the web client for Humon is also being worked on. With each hard effort, you can see either some orange (moderately hard) intervals and some red (really hard) intervals– plus some blue indicating that I’m recovering or green showing that I’m more or less recovered. That “more or less” part is important. If I were doing (my favorite) over-under workouts, for instance, I would be hitting my next interval without being fully recovered. In other words, my muscle oxygen would not have fully recovered yet. There is a lot of training value for endurance athletes in doing these kind of “not fully recovered” intervals, but you still want to at least wait until there some recovery so you push effectively on the next interval. The Humon Hex is great for this kind of workout because I think you really don’t want to go hard again until at least the blue-green transition. At the other end of the interval spectrum are sprint workouts and maxVO2 workouts where you run or bike extremely hard (think: 6-minute race pace) and then give your body a full recovery. For these workouts, you want your muscle oxygen to be well into the green range and actually max out at much as possible. Humon notes that tracking this maximum value is important and, as it starts to drop off (i.e. you can’t get your maximum oxygen as high after each hard effort), you’ll want to stop your workout because you’ve reached your limit. Here’s one of the limits I see that Humon could easily fix– if the Humon Hex app could beep when my muscle oxygen hits that upper plateau, track that high value after each interval, and prompt me to stop my workout when it starts to drop, that would be a great help for my training. So the Humon Hex is great at helping shape my recovery during intervals. At the other end of the interval spectrum, the Humon Hex also shows greater insight into my performance and how to improve it. Again, looking at my interval workout, you’ll see on my harder efforts that my muscle oxygen tanks and I’m in the red zone until I stop the interval. But I could have (and probably should have) gone longer. Why? A few weeks ago, I stumbled across Roger Schmitz’s podcast at Scientific Triathlete. Roger is the co-founder and CEO of Moxy, so he knows a thing or two about muscle oxygen. During his podcast, he mentioned that it’s ideal if you can keep the pressure on during your intervals until your blood oxygen starts to plateau at the bottom end. Right now, the Humon Hex can tell you when you are “bottoming out” just by looking at the numbers that it displays. But, if you’re working out hard and your body is screaming for an interval to end, however, you may not be in the ideal state of mind for discerning whether your blood oxygen is reached a plateau. Here again, a tiny tweak to the software to beep when I’ve hit that plateau would be enormously helpful. Nevertheless, even without that beeping function, the Humon Hex still provides great information because it validates what I’m feeling. For instance, if my sensor shows red on a fairly gentle effort or only orange on highly intense efforts, then something is amiss– and 90% of the time, it’s some fatigue or stress in my body that I don’t know about (e.g. a developing illness). Based on the description I gave above, you might get the impression that the Humon Hex is best reserved for really intense intervals for honing your anaerobic skills. In reality, just the opposite is true. In fact, as Roger Schmitz explained, the ideal interval for developing your aerobic engine appears to be an intensity that gets your SmO2 to hit a lower plateau at about five minutes. Note that this isn’t an all-out effort, so don’t use your five-minute maximum effort pace. Instead, you want an effort likely in the 7-8 minute maximum effort range. As cool as the Humon Hex is for interval training, it doesn’t help much that much with Tabata intervals or highly structured workouts– other than to provide feedback after they are done. Nonetheless, it’s quite useful and I think it’s fun to track this data to more fully understand your workouts. Initially, I thought that the Humon Hex would have limited usefulness for endurance workouts but I’m seriously rethinking that idea. While I was working out on my bike recently, I experimented with slowly increasing my power by five watts every three minutes (starting from low-mid sweet spot– about 84% FTP). Within about 10-15 watts, Humon flipped from green to orange, suggesting that I was approaching a limit, so I immediately backed off and rode the rest of my workout right on the knife’s edge just below the green-orange transition. After hanging out in green for 3-4 minutes, I’d ease myself upwards just a touch until I hit orange– and then backed down again. You can see a screenshot of my muscle oxygen values at the right. I can’t say for sure but I would say that I was right on the edge of a useful training zone– essentially, my maximal oxygen steady state before my muscle oxygen would start a slow decline. For me, this point was quite a few watts below my predicted LT threshold and my suspicion is that it coincided with the upper end of sweet spot (supposedly around 87-90% of FTP). If that’s really what’s going on, then the Humon Hex might be a great tool for pinpointing this transition point based on actual physiology instead of just taking a guess based on a percentage of FTP. Andrew Coggan and others talk about the incredible value of training at this point, but it’s mostly just based on past performance data and not on what’s going on in your body. Using this transition zone to guide your longer steady training efforts may fine tune your endurance training quite a bit more effectively than just using a power meter. I wouldn’t pay much attention to the green-orange transition within the first 20-30 minutes of a workout, however. While you’re still warming up, muscle oxygen initially takes a hit and your body starts dilating blood vessels to get oxygen to your working muscles. You could see this if the Humon displayed total hemoglobin (tHb), which it uses under the hood. If you keep up a steady state effort, eventually you’ll go back to green from orange even though you didn’t slow down your pace. The Humon folks explain this phenomenon more eloquently than I do on their site. As I noted above, muscle oxygen takes a nosedive at lactate threshold. In fact, the BSX Insight was originally marketed as a device for measuring lactate threshold by looking for the inflection point in muscle oxygenation. Unfortunately, while the BSX test was a lot easier than a full-blown 20-minute FTP test, it was still quite tiring. The Humon Hex has a built-in “incremental” mode that provides roughly the same test and, while it also recommends running to exhaustion, you really don’t have to go much further than lactate threshold. In practice, this means that, as long as you’re not too tired to ride 3-4 minutes above your lactate threshold, you can use you Humon Hex to get a quick snapshot of your lactate threshold or FTP. Here’s how it works. Then load up either Garmin Connect or TrainingPeaks, etc and calculate you average wattage during the last 3 minutes leading up to pushing the lap button. That’s today’s LT/FTP. The Humon support page includes a roughly similar test for running instead of cycling. The details of how to determine you LT vary. For instance, the folks at Humon originally just used the wattage at the orange-red transition as the LT/FTP. To me, that doesn’t make much sense because there’s a big difference between hitting the lap button as soon as you increase by 30 watts and hitting it after riding steadily at the higher effort for 3-4 minutes. Also, the folks over at BSX told me a long time ago that blood values don’t flip instantly and need a little while to fully normalize in fairly steady state efforts. On the left is a screenshot of the first LT test I did using the Humon Hex. The test ran me to exhaustion as you can see from the large red zone. I think that they do this in because there is a tendency for the red zone to not be fixed. If you do this incremental test, the orange-red transition sometimes can get messed up and so here’s how I manage it: make sure you’ve really hit it by staying there for at least 30 seconds. Remember, biological systems aren’t perfect. So you could be riding along in orange and the Humon app momentarily flashes red. Hit the lap button and keep riding. Often enough, it will flip back to orange (or sometimes even green). I don’t count the test as over until I’ve been in the red zone for at least 30 seconds. For instance, at the end of the endurance workout I did (above), I did a quick LT test and the iPhone app flipped from orange to red and back again several times until finally settling on red. I only counted the last value as the end of the test and took the average watts for the preceding 3 minutes to that point. I’ve used this incremental test on recovery days four times now– and it was perfectly spot with previous tests three of those times. The one time that it was off was a strange ride that I took after a recovery day (hence my value should by higher) but I rode in a very cold room and didn’t feel ideally warmed up (hence my value should be lower). Instead my LT/FTP was about 30-40 watts higher than it should have been. Again, this just reinforces the need for really thorough warmup. So if you are going to use the Humon Hex for FTP/LT testing, just be really sure you’re completely warmed up. So here’s a quick summary of different training ideas in using the Humon Hex. Start warmups slowly and gradually build intensity one the course of 20 minutes. Pause for a half-minute and see if your muscle oxygen is close to your normal maximum value. Continue warming up and pausing until it does. It may be necessary to engage in a few sprints or strides to get the capillaries to fully open up. Perform each interval as usual, just “recover” only to the blue-green transition and then go into the hard portion of the interval. During each recovery, you should hit the blue zone. If you only hit the green zone, you may have to go a little slower. Find an intensity that causes your muscle oxygen to hit the red zone and then start to plateau at about 5-6 minutes. Once you start to plateau, start your recovery and wait until you have reached the maximum muscle oxygen value. This can be quite challenging to perform. Also, take note of the maximum and minimum values. If you start to plateau at too high a value (during hard intervals) or too low (during recoveries) call it quits. On longer workouts, experiment with pushing pace/effort towards end or second half of workout to the border between green and orange on your Humon Hex. Try to not stay in orange, however, and back off if you hit orange. Your ability to hold this transition zone will likely depend on your fatigue level so you may want to reserve this experimentation for when you are feeling fresh. Here are the two protocols based on the information on the Humon site. Note the different time periods for each stage. Then load up either Garmin Connect or TrainingPeaks, etc and calculate you average wattage during the last 3 minutes leading up to the lap button. Then load up either Garmin Connect or TrainingPeaks, etc and calculate you average pace during the last 3 minutes leading up to the lap button. It is very important to make sure that you feel completely warmed up. Ideally, you should do a regular warmup before starting this test. Because this test is not difficult, you can perform it regularly on recovery days to track your overall fitness and fatigue. After you have done this test once or twice, don’t worry about going all the way to exhaustion. As you’re never more than 30 watts above FTP for more than four minutes, this should be an easy workout. Hit the lap button each time you make an orange–> red transition but don’t stop working out until you are consistently in the red zone for at least 30 seconds and maybe longer. All in all, I’m quite happy with my Humon Hex. I feel that it really does help guide my workouts and helps make sure that I’m performing at my best. While I’ve pointed out a number of features that could be tweaked to make it even more useful, it’s currently head and shoulders above the competition in this space. Alessandro over at Humon and I have traded emails several times. Their company is super-responsive. Here’s my prioritized wish list for features that could really make the Humon Hex shine– and I’ve been assured that their working on all of them! Color Coding on Garmin Data Field. Every athlete and coach I know wants to use their Garmin to record their workout data, so this means that the Garmin ConnectIQ app should be a secondary priority. Instead, the focus should be on the providing color coding in the Garmin Data Field. Here I’d also suggest color coding the background since that will be far easier to discern than trying to make out the color of a number. Notification and Recording of Plateaus. This is an important feature for effective interval workout. Upper plateaus during recovery are important because they indicate when a new interval should start. Lower plateaus are important because they are also likely tied to fatigue and interval effectiveness. Either the iPhone app or the Garmin data field should display a dialog when these plateaus are reached and indicate when the workout should stop based on trends in the plateau values. Because the usefulness of this kind of monitoring really depends on the type of interval, it can be controlled through the Garmin app’s settings in Garmin Express. Audio Alerts on Color Zone Transitions. If I’m running in a race and I make the orange-red transition, I’ve likely gone above threshold and I’m burning a match. Getting that information so I could slow down and pace myself would be invaluable in a really long race. Similarly, there’s something going on in the green-orange transition– and getting an alarm to tell me that I’ve crossed over would be great. These options can get pretty confusing so again, these might be options that could be toggled in the Humon Data Field’s settings in Garmin Express. Or maybe just an option for an alarm each time any color transitions is made (although that can get annoying. Better Ability to Analyze Data. It’s hard to dig into the data currently, even if your muscle oxygen values are transferred into Garmin Connect. The problem, of course, is that the color coding– which is more than half of the value of measuring muscle oxygen– doesn’t transfer to Garmin Connect. This can be done either in the Garmin app or the web client. Muscle oxygenation is the new heart rate when it comes to effective sports training. It’s only been around for a few years and, to date, the implementations have been kludgy but workable. Humon changes the game by making it a simple and effective tool. But it’s important to remember that we are still on the bleeding edge of sports technology. Humon is constantly tweaking its algorithms and improving its implementation (both in the iPhone app and the Garmin data field). It’s natural to want “everything now” when it comes to a revolutionary technology. But it’s also important to remember that Humon is a startup that only started shipping the Humon Hex at the end of the January– not even two months ago. So it’s not as if the company has been sitting on its laurels and not innovating. If you’re interested in the Humon Hex, you can use the code “HUMONATM” to get 10% off and free shipping. And you’ll be supporting the Athletic Time Machine in bringing you reviews like this one. If running in interval mode, is the 3 minute power average prior to hitting the lap button considered your FTP (Critical Power or CP in Stryd)? My protocol is to hit the lap button on my watch as soon as the Humon app goes from orange to red. But I keep riding and make sure that it stays red for at least thirty seconds before ending the test (sometimes, it fluctuates into red erroneously such as it you moved the sensor). Then I take my normalized power for the three minutes leading up to hitting the lap button. If you did the test properly and have a steady trainer, the normalized power will be within about 1-2 watts of average power. I consider this LT or lactate threshold, which corresponds with FTP pretty closely. Great post Ken! After reading your review I decided to order a humon (and I used your code). I do have a question that you may be able to answer. You detailed how you test your FTP/2nd lactate threshold (anaerobic threshold) but do you have any ideas how you would determine your 1st lactate threshold (aerobic threshold). I would be especially interested in seeing what my HR and power levels are for this threshold in order to train right under that on long endurance rides. I am wondering whether you would do a similar test to that done to find the anaerobic threshold. Thanks! That’s a really interesting question. Some might say (and I have no idea if this is verified) that aerobic threshold is the point where your smo2 stops increasing if you do a ramp workout. So start at a super easy wattage, increase by 20 watts every three minutes, and watch your smo2 go up. The moment it stops going up, you’re at your aerobic threshold. This is really interesting stuff. The FTP / LT testing in particular is intriguing; I normally do 20 minute tests, but i think i get “too amped” for them and it ends up skewing my results. How do you personally use this feature? I notice you say “that day’s” FTP. Do you recalibrate your zones before every work out based on the FTP you show right after your warmup? Or, do you test every few weeks the same as you always did, but just using this new protocol? I do it both ways, frankly. If I have time enough to do a thorough warmup (20-30 minutes), I’ll do a ramp up with an FTP test as part it it. But who really has time to do that? So I just keep a running log of results and eyeball the trends to get LT/FTP.